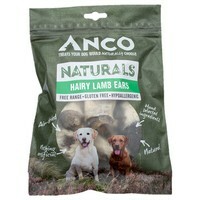 Anco Naturals Hairy Lamb Ears are hypoallergenic treats made from 100% natural Lamb Ears that have been gently air dried to preserve as much of their natural goodness as possible. Leaving the hair on the ears helps them to act as a natural wormer for your dog. Whilst the chew is digested, any parasites within the digestive tract can cling to the hair, which in turn is then passed through. Hand-picked to ensure the treats are of the highest quality, Anco Naturals contain nothing artificial and are rich in vitamins, minerals and nutrients.